The water was calm and the sun was still in the sky, hidden behind a late summer’s orange-pink evening haze. Whaka, the owner of Koha Yoga greeted us with a wild head of hair and a warm smile. He put us onto the boards and pushed us out while our teacher, Erin, instructed us to paddle toward the small island in the distance. I was secretly relieved that we would be further away from the curious eyes on the nearby piers and pontoon boats. I hate to be the fool in public. Paddling itself was surprisingly easy. After a few wobbles, I found my balance and got the hang of the rhythm of the glide. When we neared the island, we dropped our anchors and got on our backs for the first few core-strengthening positions. 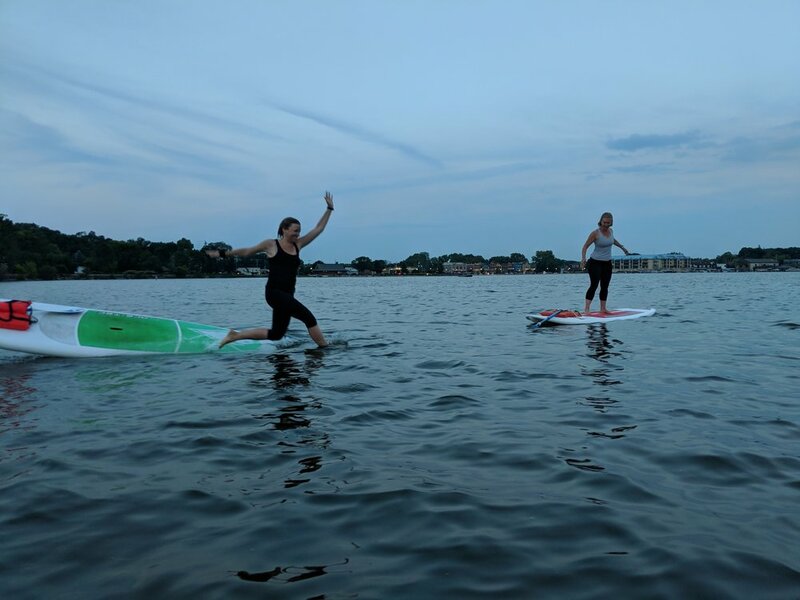 It was a gorgeous night on Pewaukee Lake and I wouldn’t have minded falling in. Except that for the first half of the class, I did mind, and all I could focus on was NOT. FALLING. IN. I could feel myself shaking with every pose. And while it should have been incredibly relaxing in such a serene environment with the water lapping gently beneath, I found it difficult to fully let myself go into the poses for fear of falling. I didn’t want to be the first. Or the only. (God forbid). I don’t actually remember when it happened. Probably coming out of one of the lunging poses, which I found the most difficult. But I toppled backwards. It felt like slow motion. 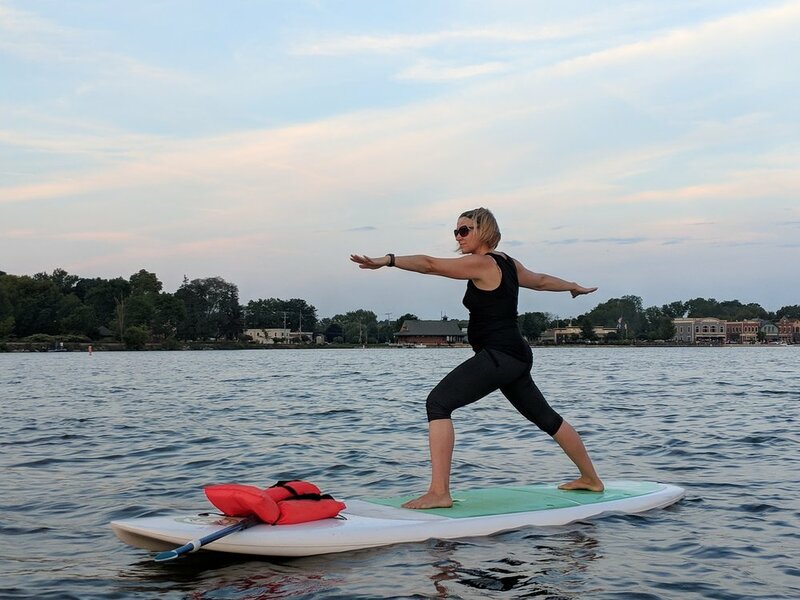 The warm-cold lake water, a shock to my system, left me gasping for breath, flailing my arms, wondering for a brief moment, if I would make it back to the board that I had not-so-gracefully shunted in the opposite direction with my fall. My classmates cheered as I pulled myself awkwardly up onto the board (everyone who falls gets applause). It took me a minute to gather myself. Thankfully, the instructor put us in child’s pose, so I could catch my breath and recombobulate. And in the few minutes I took with my nose pressed firmly to the middle of the paddle board, only two glorious words came to mind. Once I fell in, I no longer had to try NOT. FALLING. IN. The a-ha-ness of the moment sunk in immediately and I could barely contain my smile. Far from the embarrassment I thought I would feel for being the first to topple, I felt a sense of accomplishment. The smiles and cheers after my fall reminded me that this was not a competition but a practice. And perhaps my stumble broke the ice for the others. Made it okay to fall. Allowed everyone a collective sigh of relief. And someone did fall, moments later, to another round of applause. Practice ended with a (slightly colder) savasanah and then time to play. Some tried backbends, bridge poses, fish poses. The more experienced yogis tried headstands, chin stands, crow poses. I tried my favorite tree pose. And promptly fell in again. And again. But no matter. I mean really, what’s the big deal, she challenged. You make a mistake, you get back up, dust yourself off and get on with it. And maybe you’re a little less uptight the next time. If I thought I understood her words then, I REALLY understand them now. This time with my mind AND body! The whole idea of letting go of shame and letting ourselves fail has become such a clichéd mantra in this era of self-help and self-improvement. But on the cusp of my forty-third birthday, my goal for myself is to let go of perfection (do you hear that, Virgos!?) and aim to topple. On purpose, and more often. This was only part ONE of a fabulous night. What came when we got back to the dock is an entirely separate post (and otherworldly experience!). Talk about new adventures ... anyone every try flying yoga?! We did! 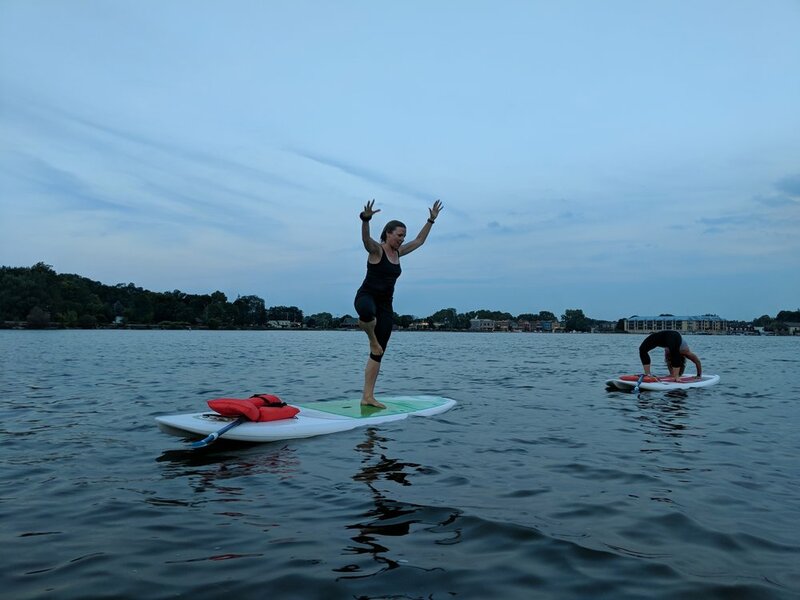 and overall incredible night to Koha Yoga and Whaka on Pewaukee Lake!